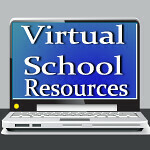 Virtual School Resources: 5 steps to a Back to School Swap Shop! I know some parents are excited about school starting in LESS THAN A MONTH! I love summer vacation, so I'm not one of those moms! However, last year we decided to start after Labor Day (because we can), and we were sorry when we still weren't finished in June! We did take a couple of vacations, but still! This year we are starting on the 20th of August. I know we will do some traveling, but we want to be done within the first couple of weeks in May. See?! I'm already thinking about next summer! 1. Pick a date for a lunch or dinner pot luck. 2. Ask everyone to bring a dish to share. As everyone else is bringing food, you supply the paper goods and drinks. 3. Ask everyone to bring clothing their kids no longer like or have outgrown. Ask them to be sure it is in good condition, and to make sure it's labeled for size. 4. Ask everyone to bring any school related items they no longer want such as last year's lunch box, pencil cases, notebooks, backpacks, etc. 5. Plan a few games for the kids to help them get reacquainted with their friends from school. A fun idea for an activity would be to make individual time capsules by filling an empty paper towel roll with summer mementos, like photos of summer vacation, notes from friends at the party, height and weight at the time of the party, and a note about what the child is most looking forward to in this school year. Wrap the paper towel roll with tissue paper, tying each end with yarn. These would be fun to open at an end of the year school party! (There I go again!) Enjoy! What are you doing to get ready for back to school? I'd love to read about it in the comments section below!